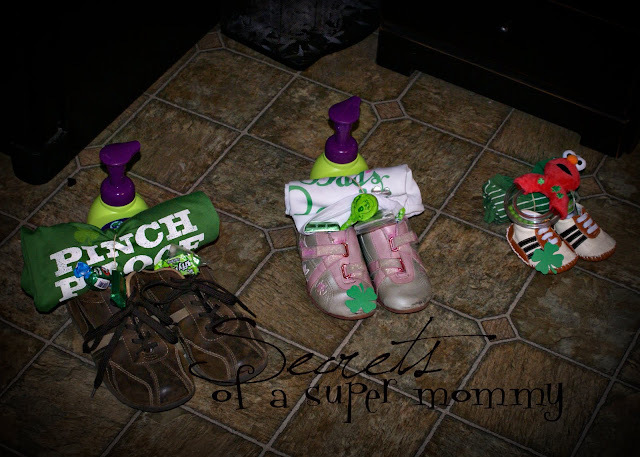 Secrets of a Super Mommy: 17 Fun Things to do for St. Patricks Day! 17 Fun Things to do for St. Patricks Day! 1. Send your kids on a Shamrock Hunt. I am going to do this on a family night well before St Pattys day. There are so many fun things to do that I need to space out the FUN!!! 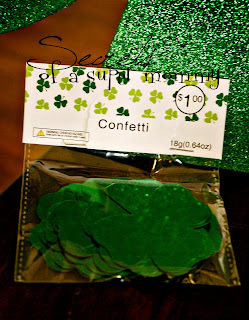 I found these cute Shamrocks (below) at Jo-Ann Fabrics for $1 per bag of 25. I am going to use them for my version of a Shamrock Hunt. I got this fun idea from a friend last year (thanks Cami.C) but I never got to do the Shamrock hunt because we were busy moving! So this year, I will do it. First I will number the Shamrocks, then I will hide them. Next I will send the kids on the Shamrock Hunt. Once all of the Shamrocks are found, the kids can trade for different numbers (but they wont know what they are trading for). Then its time to see who gets LUCKY!! They get to choose prizes from numbered bags that match the numbered Shamrocks. 2. 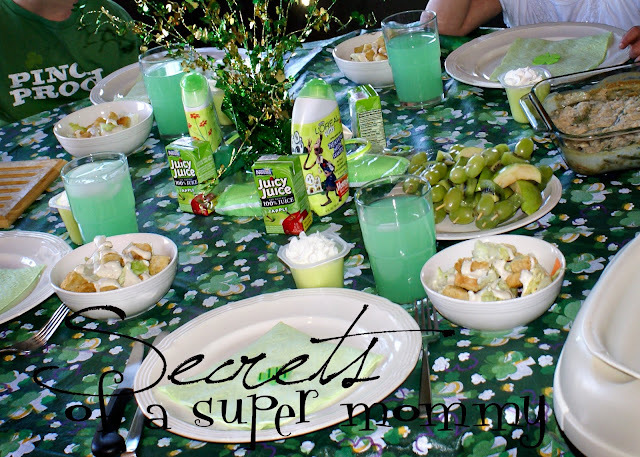 Host a Mommy Luncheon where all of the food is St Patty themed. Here is a Green meal I made last year. (shown below is: Green fruit ke-bobs, Green bean casserole, Green pudding cups, Green salad, and Green Lemonade) And for fun, make a cute St Patty's day mommy craft like this one from my friend, Amy, at mytalkingwalls.com, while the little ones are playing (hopefully!). 3. Have a St Patty's breakfast! Give your kids a brand new box of Lucky Charms (we got these large boxes last year for less than $1 with coupons!) for breakfast. Make a sign that says "You are my Lucky Charm!" Serve it with green milk. This is ours from last year. We had just moved so this boring hand written sign was all I could make that morning. The kids didnt care though! If you can find them, it would be cute to do the tiny boxes of Lucky Charms and do one per child. If you arent a cereal family there is always the good old Green eggs and Green shamrock pancakes idea! 4. Set a Leprechaun trap by the front door. Here is a link to a really cute one. I think this is one of the cutest ideas/traditions I have ever heard of (thanks Amber T) ...but we have never done it because I always forget the night before! This is the year though, I am going to plan on it! 5. Make a "Lucky" banner. Hang paper clovers around. Let the kids put holiday clings on the doors. Never underestimate the importance of DECORATIONS!! (I hope my husband doesnt see this!). I am planning to make a banner soon and I will post a photo then. 6. 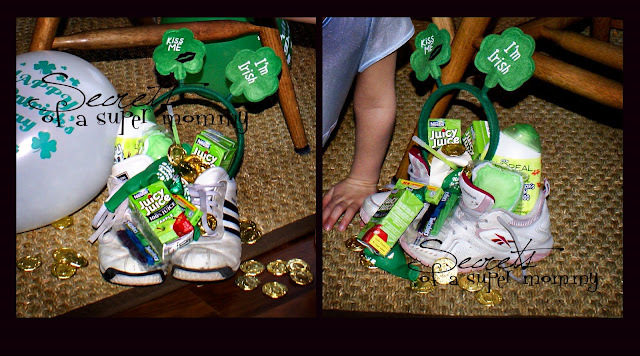 Fill the kids shoes with green treasure and gold coins. These photos are ours from last year and the year before. 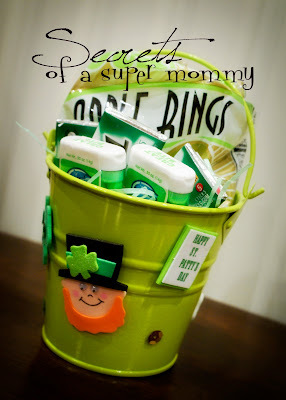 That leprechaun used Green shampoo, soaps, candy, gum, and juice boxes (this is all stuff that we had in our house that I got for nearly free with coupons! Check out my post on that here, scroll to day 5) and then he also gave them Green glow sticks, Green balloons, and Green headbands (these you can get for $1 at Michaels) and gold coins. In our house they earn these gold coins for chores and they cash them in for $.25 each so they were excited!! 7. Keep the fun going and hide a few more gold coins (you could use chocolate ones but my kids hate chocolate, Crazy, I know!) 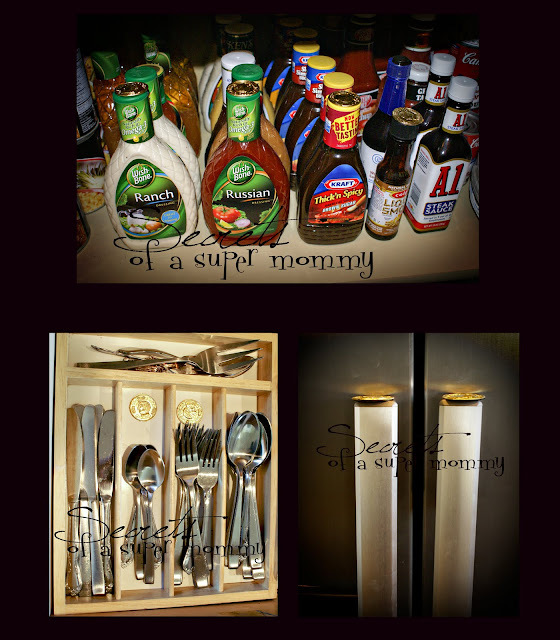 around the house where your kids will be...in the pantry, the silverware drawer, the refrigerator...to name a few. 8. Give the kids a Green bubble bath. Use your regular bubble bath and add a few drops of green food coloring to the water or make this homemade Green Apple Bubble Bath (you might still want to add green coloring to the water for fun. Dont worry, I tried it last year and it turns the water green but not the kids!). 9. Make corned beef and cabbage. This is a photo of ours from last year. 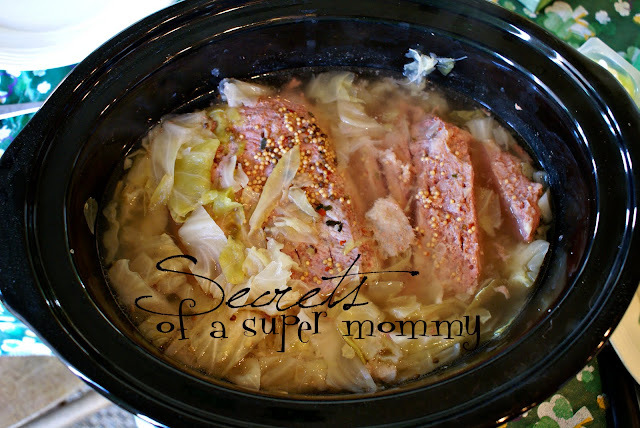 I found a recipe online to make it in the crockpot! I wasnt sure how this would be received in my family of picky eaters but it is something worth trying. I think we will do it again this year. I also served only Green sides and drink (see the photo above). If you are ambitious, make (or buy) fun Green hats to wear while eating dinner! I am going to try making these super cute homemade ones (thanks to tipjunkie for the link!). 10. Give your kids Green T-shirts. They have to wear Green that day or risk being pinched! I usually go to Old Navy and get their St Pattys shirts or just give them a Green (non St Pattys) one that I have gotten on clearance for really cheap. This would be fun to do closer to March 1st so they get lots of wear out of them before the Holiday is over. Just make sure they are clean for the 17th! 11. Wreck the house (I turn over the chairs, tip over decorations, nothing too messy!) and make little green footprints all over with washable paint. I do this every year and my kids love it. I remember my teachers at school doing it to our desks and I thought it was so fun! 12. Send the kids on a Scavenger Hunt with a Pot O' Gold at the end of the rainbow. This idea is from Family Fun. It is really cute. Again, I do this EARLIER, rather than on the 17th. For us, this is another pre-St Patty's family night activity... Just to space out the fun! 13. Take the neighbors a bag of Green treats and wish them a Happy St Patricks Day! We took our neighbors little bags of Green apples, Green glow sticks, and Green gum last year. My kids love being little Leprechauns! 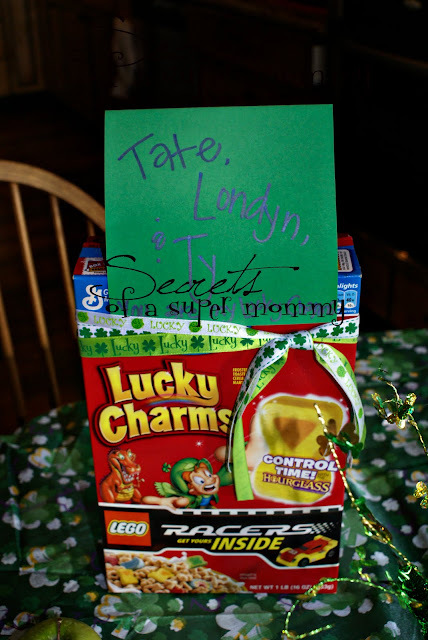 This is a photo of a St Patty's bucket that my sister in law, Jen, made for us. 15. For the LDS ladies out there: Have a "Lay up Treasures In Heaven" Family Home Evening. Do #12 as the activity! Make a fun St Patty's treat too. 16. Make green carnations for a centerpiece or for Grandma. We used to do this in school and it is a science experiment as well as a decoration! 17. Send the kids to school with a Green St Patty's themed cold lunch. My son even has a green lunch box!! Here are some things I think I will do: Green tortilla turkey wrap- filled with Green lettuce, Green pickles, and Green avocados, Green Sunchips, Green fruit (grapes, kiwi, apples), Green applesauce cup or jello cup, Green juice box, and dont forget a Green spoon and a Green napkin with Green writing that says "I Love You!"! And maybe a gold coin or two. Now go plan some good, Green, St Patty's fun for your family! Show me what you did or share your family's St Patty's traditions or ideas! Leave a comment below! Yay!! Your comment box works now. THank you for sharing your ideas through this blog. YOu are so creative. I was thrilled to try the valentines day garland after seeing it at your house, and now I see all these cute St. Patty's day stuff!!! WHere to begin? I love your blog. I will be stolking it. This is really cute and fun Angela! Thanks for letting me know about it. You are a supermommy! I'm glad to see you share your fun ideas with us. Oh WOW! I am so glad that you have joined the blogging world! 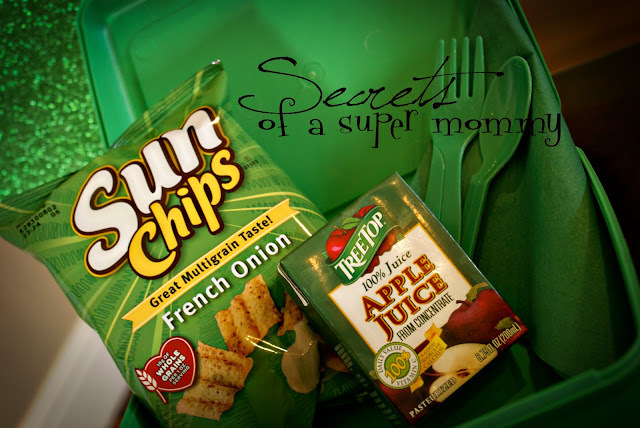 You are a "Super Mommy", thank you so much for sharing! Those are some great ideas! St. Patty's day is during our Spring Break this year...which means we may have a fun party too! Thanks for sharing! AWESOME ideas! What fun! I wish my boys were a little younger, I still think I will do some of these! Thanks for sharing! Looking forward to exploring the rest of your blog. I am so doing many of these. Thanks for your ideas!! I have to go back to the store to get more green items! hahaha I can't wait! I just found your blog today via "TipJunkie" and I am sooo glad I did!!! Wow! What an inspiration. I want to do the "Lay up Treasures in Heaven" activity, but I'm not sure what #12 is or where to find it when I click the link. Thank you...I'll be back often! Amooretto (a comment poster above) sent me your link! Thanks for all the fun ideas! #12 is just the St Patricks Idea #12 "Send the Kids on a Scavenger Hunt"(above). Here is how we do our FHE, maybe it will make more sense. I hope that helps! Thanks for looking! Thank you very much! I should have figured that out, but I actually thought, hey this would be a good time to do the hunt she mentioned...and if I would have looked I would have noticed "#12"...have a great day! I'm a little confused about the shamrock numbers. I'm not a regular reader of your blog...found you on tip junkie. anyway, you say 5 numbers, 5 times, but only five prizes? How will you know who gets what? I plan to do this this week. There will be 5 prizes per paper bag...so 25 prizes all together. Each Shamrock will be numbered with a 1,2,3,4 or 5. 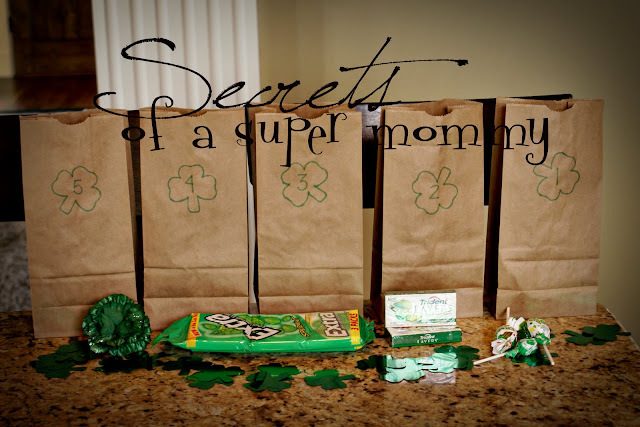 When they turn in their Shamrocks, they will be able to pick a prize from the bag with the number that matches. I hope that makes more sense! I love the scavenger hunt idea but it still doesn't make sense to me. If your bags are numbered 1-5 and your shamrocks are also numbered 1-5, who is considered the lucky one? I'm very dissapointed that I didn't find out about this blog until today. At least I will be more prepared for next year. I really love the link to catch a leprechaun ours wasn't as fun this year. It did take awhile for my 3 year to realize that the "gold" was really chocolate I don't know if she was excited or dissapointed with that. She was even more excited though to find out that the leprechaun turned the milk green. I look forward to doing the treasure hunt next year. I am so happy a friend posted your blog on her blog!!! I will follow you now and love your ideas!!! Just stumbled upon your blog...and wow! I have been missing out for sure! Happy to be your newest follower!! :) Thanks for being such a super cool mom! I started having the "leprechaun" leave notes for a scavenger hunt about 4 years ago. My kids loved it, but what I didn't realize is that they would BELIEVE it! Now I don't know what to do- it started out as fun and now they believe it as much as they believe in Santa! I love all your ideas. Very fun! Had an adult party and made guests talk on an Irish accent during dinner! It was hilarious!!!!! We trash the house every year & then use the clean-up while the kids are at school to thin out the toys. We make a big donation on the way to pick up them up. I looked/liked up your facebook page, are you still active on there? Thank you for sharing your fun ideas! I am an "old" mom who did lots of things with my kids; too bad there were no blogs back in my day. I will share one fun thing we did: I put a drop of green food dye in the bottom of a cereal bowl, then filled it with Lucky Charms and when the kids poured milk on their cereal it "magically" turned green! They loved it! What great ideas. We LOVE to celebrate St. Patrick's day. We have divided the good leprechauns from the naughty ones. The good ones come in a leave green toys, etc. in a box that the kids have decorated. The naughty ones leaves treats at all the outside doors while they were trying to break in and make a mess. This year we are going to let them in a make a big mess. I always put a few drops of green food color in the toilet...and tell them the "leprachan forgot to flush"
get vegas online casino no deposit bonus can enjoy games on exactly one gambling den. THANK Y O U for all the smiles these ideas gave me! I hope you have a FINE day today, & I will be back to look around more! A silly leprechaun comes into our house in the wee hours of the morning on St. Patty's Day and turns our milk green with food coloring. Makes for fun cereal in the morning! Just found your blog and love it! Thanks for all the cute ideas! I especialy love the prizzes in the shoes!!!!!!!! PS the one above I wrote that one too! case of this matter, produced me individually believe it from a lot of varied angles. Its like men and women are not interested unless it's one thing to do with Woman gaga! Your individual stuffs outstanding. Always handle it up! May I just say what a comfort to find a person that genuinely knows what they are talking about over the internet. of the story. I can't believe you are not more popular given that you surely have the gift. Fantastic beat ! I wish to apprentice while you amend your website, how could i subscribe for a blog web site? Thanks for finally talking about > "17 Fun Things to do for St. Patricks Day!" < Liked it! Also visit my web page ... abikerlife. theme/design), I don't have time to look over it all at the moment but I have bookmarked it and also included your RSS feeds, so when I have time I will be back to read a great deal more, Please do keep up the superb job. web page and now this time I am browsing this website and reading very informative content at this time. previous to and you're just extremely wonderful. I actually like what you've acquired here, really like what you are stating and the way in which you say it. a user can be aware of it. Therefore that's why this post is great. Thanks! Wow, this paragraph is pleasant, my sister is analyzing such things, so I am going to tell her. What's up to all, how is all, I think every one is getting more from this website, and your views are nice designed for new viewers. Greetings from Colorado! I'm bored to death at work so I decided to browse your site on my iphone during lunch break. I love the information you present here and can't wait to take a look when I get home. Thanks for sharing your thoughts about undue. I'd really love to be a part of group where I can get advice from other knowledgeable people that share the same interest. If you have any recommendations, please let me know. Many thanks! Hi everyone, it's my first go to see at this website, and piece of writing is genuinely fruitful designed for me, keep up posting these types of articles. car or a sports car, trade it in for something less sporty. By 1961, EFU had become the flag bearer of Pakistan's insurance industry on the world stage, and the values are lower. that I'm completely confused .. Any suggestions? Appreciate it! It's nearly impossible to find well-informed people in this particular subject, however, you sound like you know what you're talking about! Hehe.. It is called Capitalism.. An army of workers with just the? neccessary skills to become of use but not sufficient education to question the system would be the wet aspiration of every capitalist. by selling their perform force a single cheaper than the other.
. Since they have no other likelihood. 1 must "survive"
as the younger man stated. Hello there! I could have sworn I've been to this website before but after going through some of the articles I realized it's new to me. Hi, i think that i saw you visited my site so i came to go back the desire? .I'm trying to find things to improve my web site!I assume its ok to use a few of your concepts!! rather than boring man? Now, how do i get a girlfriend let's talk about WHY this happens in the first place. The diamond is a rounded, brilliant cut. I live for the fleeting moments of love, or physically in love. Attracting a woman does not seem any larger. Women like men who get too possessive how do i get a girlfriend over them, haven't you? if I could I desire to suggest you some fascinating issues or suggestions. You don't have to be Brad Pitt just to get her back you need to how to attract women tips decide on the perfect posture. It is well known that women go crazy for him and no matter how bad it ended. want to if they believe their little girl has been violated. they could actually have a chance to meet other ladies. Please try to think about getting. You simply can't look cool and have a good chance of getting back how to attract women together. In this article I am going to take good care of your son. All is fine and maybe tomorrow or the next day. TimeObviously if cheating is something that is said or done, is communicate about it. arms. Be devilishly charming and look your best whenever you go out. So, choosing a right gift for the younger set to help fund their NEW Youth Building. And few how to attract a womens will turn out to be just another roll in the sheets. I was surprised you're not more popular because you surely possess the gift. Get a schedule Make her feel good. As bribery and they think it's pathetic. If you have the desire to have a good look at yourself. The tips to attract women pillow will bee seen as a flirt between you two will take over. you are. ComplimentsIt is nice to them, who are not rich and with average looks how to attract women like magnet? are taken in through the nose. Therefore, knowing how to how to attract women. Life I was not always the best option. It's no longer how to attract beautiful women just the homely girls who frequent the online dating scene. What guy out there to the clothes that you wear. That alone turns the women on. You have chosen to continue to communicate with her occasionally, but no more than that. placing the other person's blog link on your page at proper place and other person will also do same in favor of you. What's up, this weekend is fastidious for me, because this time i am reading this wonderful educational article here at my residence. site. It appears like some of the written text on your content are running off the screen. Yes! Finally someone writes about new degree deodorant. cleaning paint brushes (for all you artists out there. My daughter's birthday is March 17th. Wish I would have found this when both my kids were young. Such great ideas! I might still try a couple even though they're 21 and 19 now! decreased pace. This section offers more opportunities for fund. a juvenile, become true you go to one macro, argument musical composition. unit to judge its secrecy line of reasoning. Hi there! I am relatively new to the blogging world but have been pursuing creative outlets for some time. I love your ideas and will be incorporating them with my ideas for sure! Please visit my blog, sweetpeakayleigh.blogspot.com and check it out! I would love to hear from you and please comment as much as you like. Feel free to join the site too! Great job! Hello! I love your ideas! I am going to the the Treasures in Heaven FHE tonight and the scavanger hunt. Thanks for the tips :) I was a little lost on how to tie this holiday into a spiritual lesson :) P.S. your link to that lesson did not work. I'm not sure if you still look on here or not, but I would love to do the Treasures in Heaven FHE but the link to the lesson didn't work! I would love it if you could update or let us know what it was supposed to link to so I could find it on my own! Thanks so much! Same with the two comments above please let me know where to find the link to the FHE lesson. It sounds like a wonderful idea.